Absynth is one of the greatest synths of all time to program pads with. 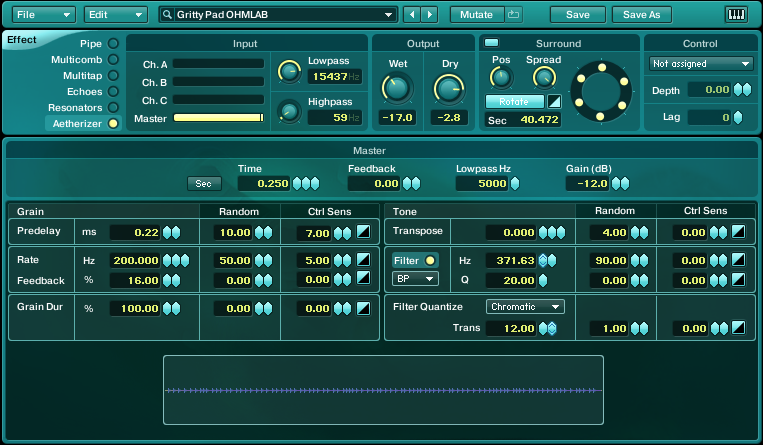 This quick tutorial will share how to make a nice gritty Absynth synth pad that can be used in just about any modern style of music. Sometimes you need a synth pad that has an edge and a little grit to it. This easy to follow NI Absynth tutorial will walk you through the steps taken to make one kind of Absynth synth pad that can provide some serious atmosphere and attitude to your projects. Whether you are working on something dark or upbeat, it is sure to inspire and captivate both your and your audience. 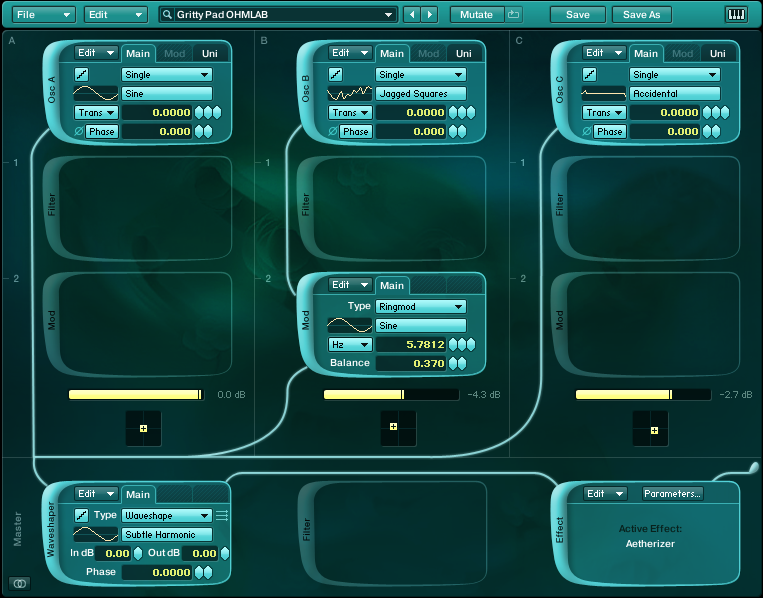 This synth does not require too many steps to make and is a good place for someone new to Absynth sound design to gain some familiarity with the interface, features and navigation to help build a basic workflow. If you are up to some experimentation, this sound is easily transformed into something much more complex by taking advantage of the highly advanced flexible envelope features. If you happen to expand upon this sound in one of your projects, we’d love to hear it and help you share it! This Absynth synth pad starts off with setting up all three main oscillator modules on the Patch window. A single default sine wave is loaded into the Oscillator A module, running two voices (set on the Uni tab of the oscillator module). A single Jagged Squares waveform is loaded into the Oscillator B module, also running two voices. And a single Accidental waveform is loaded into the Oscillator C module, running two voices. Oscillator B is routed through a Ringmod unit, running a sine wave before it is sent to the main output strip with the other oscillators. Here a Waveshaper is introduced, running a Subtle Harmonic waveform, before our sound is processed by the Absynth Aetherizer effect. 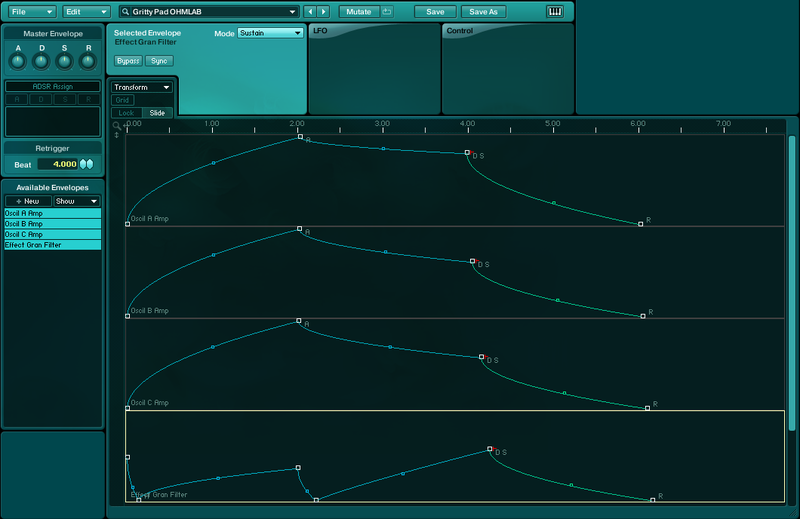 Here you can see the Aetherizer set up on the Effects window for this Absynth synth pad. By right-clicking on the Hz field of the Bypass Filter panel, we can create an envelope to modulate this parameter as our sound is played. As you can see in the image of the Envelope window below, the curves of all three main oscillators are basically the same. This helps ensure even and consistent delivery and development of sound. You can also see the envelope that was created to modulate the bypass filter on the Aetherizer effect. This adds a slight movement and provides added character to our Absynth synth pad. Below is a small audio sample of this Absynth synth pad in action alongside soem drums to give you a better idea of how it may work in a mix. Of course, the delivery and development of this sound is easily changed by simply adjusting the curve of the envelopes to better fit your projects’ needs.